Aw....Ice Age! I loved that movie! I think I was 24 or so when it came out, but I liked it anyway. I've always had a soft spot in my heart for cartoons. Ice Age, the movies, were not, technically, accurate, per se. First off, animals do not speak English. Especially since English, as a language, wouldn't be used for another 10-15,000 years. And, to the disappointment of hundreds of children, there were no such things as saber-toothed squirrels. In 2002, in Argentina, paleontologists found an almost complete skull of a creature they didn't recognize. It was found in a bone bed where they were digging up early dinosaurs. The skull was mostly encased in rock, so it was very hard to identify. Finally, in 2005, they sent it to a technician who proceeded to free it from the matrix. What the technician uncovered wasn't, in fact, a dinosaur. It turned out to be a new species. It was named Cronopio dentiacutus. Not only was it new, it also turned out to be the second oldest mammal skull ever found in South America. We've known for a long time that mammals and dinosaurs lived together. But, because the dinosaurs ate the mammals, they were all small, burrowing, nocturnal creatures. If a mammal was the size of a house cat, it was a giant. Most were mouse sized. C. dentiauctus was about 9 inches long. It had a long snout, and shared many qualities with modern day shrews and squirrels. It also had two gigantic fangs. It was.....a saber-toothed squirrel. After the age of the dinosaurs, when mammals became dominant, it seemed every mammal had either horns or saber teeth. Horned gophers facing off against saber toothed goats would have been something to see, eh? But, this squirrel live a long time before that. About 150 million years before that, in fact. This little creature lived with dinosaurs. It probably foraged for the leaves and seeds that were dropped by the dinosaurs. Judging from it's skull, it didn't have a very powerful bite, so it's fangs were most likely used for breaking open seeds, or for digging burrows. 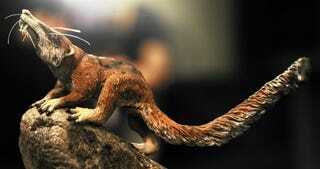 But, reconstructions of the creature show that it looks remarkably similar to the saber toothed squirrel from the movie Ice Age. So, while their made up critter may have actually lived, it was around about 215 million years ago. Not 10-15,000 years as the movie suggests. You'd think Hollywood animators would do their research on creatures that were't discovered yet so they could get the time frame correct.